did you know the world health organization has declared shift work a carcinogen? 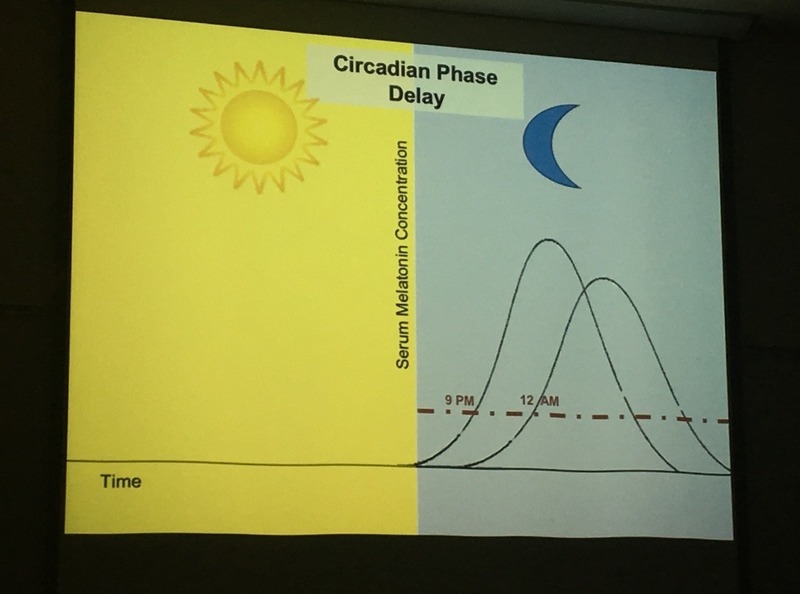 As we know, sleep is strongly based on circadian rhythms (genetic/physiological responses to light/dark cycles.) *But* sleep patterns have to be trained (via regular sleep, activity, and light patterns). They also vary among people— in particular people of European descent tend to have longer cycles and people of African descent tend to have shorter cycles, probably due to differences in light patterns at those latitudes. This has actually been linked to increased sleep delay (which we’ll talk about in a minute) and resulting negative health consequences/ increased depression in African Americans. Loosely, exposure to sunlight (and blue light, like from electronic screens) suppresses melatonin production during the day. After the sun goes down, melatonin spikes, causing drowsiness. People with certain genetics, people with Seasonal Affective Disorder, etc, often experience “sleep delay” where their melatonin levels spike later and not as much. (Basically, they genetically respond to light differently). This leads to later bedtimes, lower quality sleep, and greater incidence of insomnia. Another thing that can contribute to this is environment, for example not enough sunlight during the day, which leads to less suppression of melatonin during the day and later and lower spiking at night. (Basically imagine you move the line in the left sunlight part of the graph up and look how the height and starting point of the night time peak would change). Well, sleep delay is correlated with depression, mood regulation disorders, central body weight gain (the kind that correlates with heart problems), increased cancer, and decreased lifespan. Also, “night owls” (people that don’t feel sleepy in the evening) are 3 times less likely to experience remission of depression. ADHD is often correlated with lower quality sleep, both because of sleep delay and because of trouble with sleep maintenance (you are more likely to wake up at night.). Ditto caffeine and stimulants— they don’t necessarily interfere with you *falling* asleep, but they decrease sleep quality by interfering with sleep maintenance. ADHD symptoms are also *worsened* by low quality sleep, so that’s a fun cycle. Adults, and/or people who have spent years on shortened sleep schedules often have problems with “early morning arousal” (not the fun kind) where sleep is terminated early. So for example “no matter when I go to sleep, I only sleep for 4 hours.” This is also a problem with sleep maintenance, and apparently can sometimes be retrained with cognitive behavioral therapy, although don’t ask me how. But, happy thought: a lot of this stuff CAN actually be addressed, with some effort, and assuming your society values sleep enough to not lock you in a job where you can’t get off of a life-shortening irregular sleep schedule.